Long after the initial wave of hype, chatbots are still growing in popularity. They’ve become more adept at understanding and talking to us. In turn, businesses and consumers alike have grown more comfortable interacting with them. A predominant use for chatbots is (predictably) web-based customer service. The helpful tech tools have been busy improving the accessibility of online support. They’ve supported customers with basic queries and eased the load for customer service agents. Now, chatbots are establishing themselves in call centres. The rise of the call centre chatbot begs the question: are they really up to the challenge? And, if so, will chatbots displace call centre jobs? Last year, M&S introduced their call centre chatbot. The chatbot is integrated with Twilio’s speech recognition and Google’s Dialogflow AI. This enables the chatbot to listen to the customer and transcribe what they say. Before this kind of vocal chatbot, chatbots were settling into web-based customer service roles. They were learning to handle inbound queries, offering FAQ answers and managing live chat routing, among other things. In contrast, their rise into a speech-based call centre environment appears a step up. Now, chatbots are not just found in common support functions – they’re handling more queries and more tasks, both inbound and outbound. And, as chatbots grow more capable, they’re likely to continue to rise to the call centre challenge. So, what makes chatbots suitable — and useful — within a call centre environment? The most obvious answer is their ability to handle call routing, as seen in M&S’s call centre chatbot. Chatbot routing is a way to replace the much-hated IVR systems plaguing call centres. Indeed, routing is currently the most common use for the call centre chatbot. But it’s not the only thing the technology can do. Chatbots bring a host of benefits to call centres, for customers and agents alike. For customers, call centre chatbots mean an increase in speed and efficiency. They no longer need to endure long hold times or tedious IVR phone trees for answers to basic queries and requests. Instead, the telephone-based chatbot can help right away. For example, when asked, it could inform callers of opening times. Or, it could automate a basic process like checking on delivery status. As a result, callers waiting on hold will be in shorter queues. (Only the callers with more complex issues need routing to an agent.) So, such callers reach a human representative much faster. 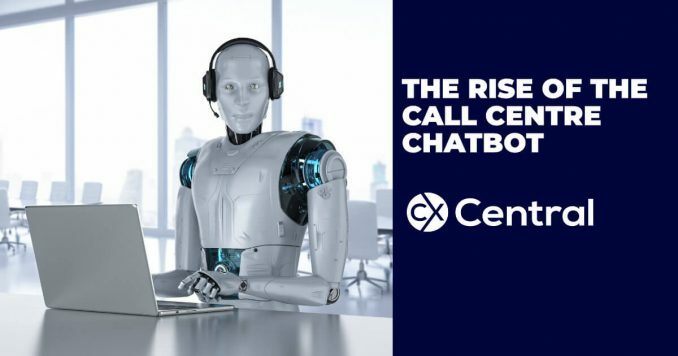 For agents, meanwhile, call centre chatbots lighten the load of high call volumes, and reduce operational costs in the process. Simple, tedious queries and tasks are taken off the hands of call centre agents. These are then replaced with harder, more rewarding issues to solve. The death of our jobs? As with any application of artificial intelligence or automation, anxieties surround the rise of the call centre chatbot. Concerns are that chatbots are taking call centre jobs, but this is not exactly the case. Returning to the M&S example of call centre chatbot implementation, the 100 workers that the chatbot displaced did not lose their jobs. Rather, they were assigned to new roles within the company. And this is how chatbots work. They are not capable of providing great customer service on their own. Chatbots are tools. And, just as a hammer is incapable of hitting a nail into a wall on its own, a chatbot can’t make a good call centre experience without human agents behind it. Artificial intelligence and natural language processing have come a long way, but they still have further to go. Chatbots are not capable of understanding the nuances of human speech or thought. They can’t pick up on tonal cues, solve problems or compromise as a human agent can. So, there’s still a distinct need for human call centre agents, even amidst the rise of the call centre chatbot. That said, the future of chatbots is bright. As artificial intelligence and natural language processing improve, so too will chatbots. The rise of the call centre chatbot isn’t set to slow down any time soon. Rather, the future of call centre chatbots will see the technology become ever-more adept at helping us.